Beating an addiction requires a huge commitment, and discovering how to get sober is the first step. Once you acknowledge there’s a problem and begin to get sober, you’ll find many options for addiction recovery. Commit to stop using the substance. Set long-term and short-term goals. Develop a plan of treatment. Plan to live a life free of substance abuse. Addicts wondering how to quit using drugs may find that committing to stopping can be an excellent first step. Getting sober can take a lot of time and effort, so if you can find reasons to stop and state them clearly, you will likely have a better chance for recovery. Take an honest look at the costs and benefits of using drugs. If you find that the costs are outweighing the benefits, then maybe it’s time to make a change. Committing is hard. We are more likely to commit when we truly feel the pain of the consequences of drug use. This isn’t meant to make us feel guilty – just to acknowledge that we may not be living the life we want to live. You would like to rebuild damaged relationships with children, a spouse or other family members. Addiction is damaging your professional life and threatening your ability to make a living. You want to live a healthy lifestyle. You have put your life in jeopardy by consistently using in dangerous situations. The addiction has caused you severe financial stress or legal problems. Drug or alcohol use has caused black-outs, and you want to be able to remember life events. More important than knowing how to stop abusing drugs or how to quit drinking alcohol is setting goals that make the process less stressful. You should set realistic goals, both for the short and long term. These goals must be specific and measurable. Short-term goals are important because they help to build your confidence and encourage continued abstinent behaviors. Make sure to write them down. Below are some examples of realistic short-term goals. 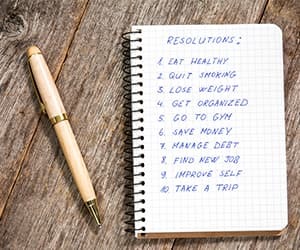 Completing these goals will encourage you to continue on your path to recovery. Remember to take it easy on yourself. We all mess up on our goals. Often, when we slip up, this causes more guilt and shame, which then leads to more drug use. Realize that achieving goals is a process. We have to trip and fall. That’s how we learn. My goal is to attend three 12-step program meetings this week. My goal is to enter a 30-day inpatient treatment program. I can do this by calling a treatment support advisor at 1-888-319-2606 Who Answers? to get more information on which one is best for me. My goal is to remain abstinent for two weeks straight. If I succeed, I will reward myself with an enjoyable, sober activity or favorite food. My goal is to remain abstinent for four weeks straight. If I succeed, I will take a weekend trip somewhere. My goal is to exercise five days a week, by riding my bike each evening after work. My goal is to spend more time with my family. I will do this by designating every Sunday as a family day. I will spend all day with them doing a fun, family activity such as going to the park, playing games, going to the pool, going to an amusement park, going roller-skating, etc. My goal is to be drug and alcohol-free for one year. If I achieve this, I will schedule a week-long vacation to somewhere I’ve always wanted to go. My goal is to form a healthy and sober circle of friends that are supportive and encouraging. I will do this by opening up more at meetings and approaching others. My goal is to attend therapy twice a week for a year. My goal is to get a promotion at work within two years. I will do this by putting in extra work, going above and beyond, and being innovative and proactive. Gradually reducing your drug use helps you prepare for a sustainable drug- or alcohol-free life. If, however, the addiction in question is alcoholism, you should be sure to detox from alcohol in a treatment facility to avoid possible medical consequences. Similarly, if you believe that you have ingested toxic amounts of any drug, be sure to seek professional medical attention immediately. Rehab centers remove you from unhealthy environments and triggers. Many addicts who want to learn how to get sober might find that a treatment facility is the best option. Entering a rehabilitation facility can be a good way to remove yourself from an unhealthy home environment or other triggering situations, as well as to promote complete accountability in a structured, therapeutic environment. Inpatient treatment: Typically, inpatient treatment programs last 30 days, 60 days, or 90 days. But these lengths can be adjusted according to your personal needs. When living at the treatment facility, you can escape your using environment to focus solely on your recovery. Outpatient treatment: Outpatient rehab options include intensive outpatient, partial hospitalization and standard outpatient treatment. Intensive and partial are more structured, and typically time-intensive treatment programs. You attend therapy a number of times per week, depending on the intensity of the program. Standard outpatient programs typically require you to attend once per week and may gradually decrease this rate over time. 12-step programs: 12-step programs such as Alcoholics Anonymous and Narcotics Anonymous are free to join and have meetings all across the United States and Canada. 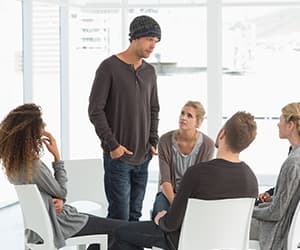 Alternative support groups: Groups such as SMART Recovery and Secular Organizations for Sobriety forego the more spiritual atmosphere of 12-step programs and base recovery on scientific principles and ongoing acquisition of knowledge. 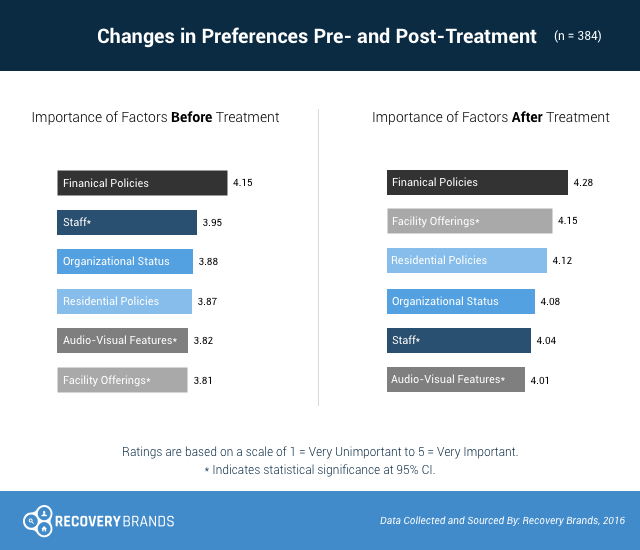 Recovery Brands conducted a survey in 2016 that asked patients that were leaving a rehab clinic what facets were vital to examine when looking at treatment programs. Their most important consideration was the facility’s financial policies – financial support, insurance accepted, and payment options. They also prioritized the clinic’s offerings (recreational activities, comforts, quality of housing, etc.) much more after they finished treatment. People considering programs may want to look at a clinic’s financial options as well as its offerings. Medical monitoring. The staff ensure you are monitored, both to deter any additional substance abuse and make certain that other medical issues are taken care of. Elimination of temptations. The use of an addiction treatment center also eliminates the temptation to use by providing an environment free of drugs and alcohol. This alone can give you breathing room to take a hard look at the damage that’s been done by the substances and strengthen your resolve to live drug- or alcohol-free. Who Answers? anytime to speak with a representative about recovery options for drugs and alcohol and how to pay for treatment. You have a much better chance for recovery if you have a strong network of friends, family and others who’ve been in the same situation. This can include meetings or regular phone calls as well as making use of organizations such as Alcoholics Anonymous or Narcotics Anonymous. With this support, you will know there’s always someone to talk to and who will help talk you down when you are feeling tempted. By the same token, you should take steps to avoid being around others who haven’t made the commitment to quit, as old habits can resurface in an instant. You should never have to battle addiction alone. Creating a strong network of friends and family members will help to prevent relapse and will provide you with support and encouragement along the way. Once a recovery plan is in motion, it is important to understand that recovery doesn’t happen in a day. You should plan how to overcome temptation, as there are always people around who’ll encourage or pressure you to fall back into old habits. Create strategies to deal with cravings. Plan how to stop cravings and have a process in place to deal with these as they occur. Find new hobbies and develop new habits. Hobbies such as music, art or exercise can help the process along, as these things break the cycle and create new and healthy habits to replace old ones. Make a list of why you want to get sober and look at it regularly. Make lists to remind yourself why you need to get sober and what is at stake if you fail. Focus your attention on something else (distraction): a book, music, a phone call, etc. Exercise, go outside, or spend time in nature. Mindfully attend to your cravings. Instead of trying to avoid them, explore them. You’ll find that they are temporary and will pass away. Hold an ice cube in your hand for 5 minutes or dunk your face in ice-cold water. This is a trick used in dialectical behavior therapy that helps “reset” your nervous system. With the right support system in place, many addicts find themselves conquering what they thought was an impossible struggle. These preliminary steps, along with accountability, can help you move forward addiction-free. As individual problems require individualized treatment, creating a personalized plan to implement these steps can help provide the structure needed to face the problem and beat it. Call 1-888-319-2606 Who Answers? if you would like more details about your drug and alcohol rehab center options, including information on how to pay for treatment.